Have you ever wondered why crape myrtles bloom in summer and poinsettias during the winter? It is because plants can keep perfect time, unless you and I monkey with their clocks. They also do not care if it is daylight or standard time. And they are not going to be late for the blooming season. Plants use the sun as their time keeper. As the days lengthen or shorten they determine when it is time to flower or time to decline. Crape myrtles are long day plants. That means they flower when the days become longer and are almost always in bloom by the end of May and continue to flower through September. Poinsettias are short day plants and get their signal to bloom around the middle of October. 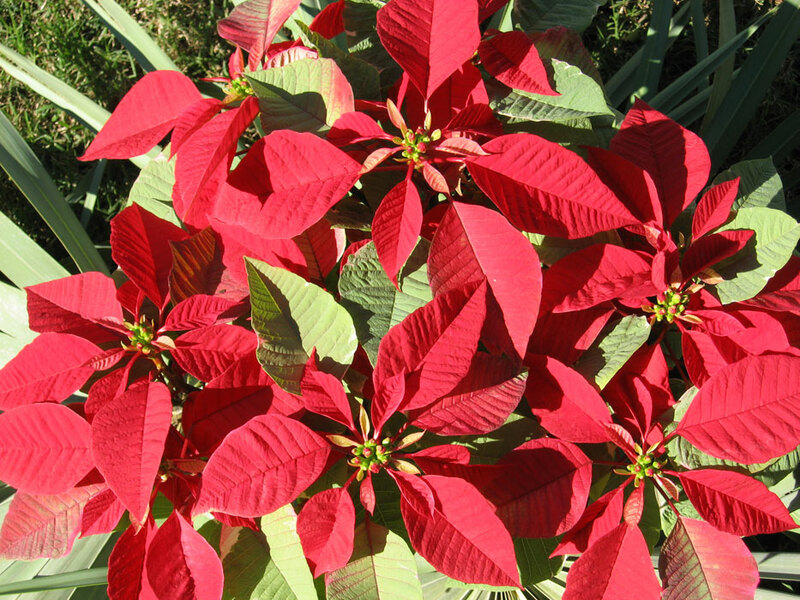 Your poinsettias should be showing color now - unless you have affected their clocks. All you have to do to affect when light sensitive plants flower or decline is lengthen or shorten their daylight. Remember the crape myrtle in bloom during the summer? If it is near a street light it is going to flower and grow into the fall. In fact if it stays active during the cooler weather it becomes more susceptible to a freeze. So we want these shrubs and small trees to take a rest on time. Poinsettias and other short day plants like Christmas cactus, kalanchoe and chrysanthemums can have their time clocks affected by extending the daylight too. Just a porch light, quick flick on and off of a room light or street light could keep them from blooming on schedule or not at all. There have been reports of Christmas cactus that never bloom. You can bet it is all due to a nighttime light. So, if you want these plants to flower, turn off the lights at night or cover them from dusk to dawn with a box or similar container. Now, some plants don't care what time it is. I think we know people like this, active night and day. In the plant world we call these day neutral plants. Some might include zinnias, salvia, pentas, pansies, petunias, tomatoes, peppers and similar. They are going to bloom year-round unless affected by weather. For some of these it gets too hot or too cold. But otherwise they are going to flower. Get to know your plants. Are they short day, long day or don't they care? It is important to know at least this much about your plants to know what to plant and the care they need. You are going to find most keep perfect time if we let them.